Maker is comprised of a stable coin, collateral loans, and decentralized governance. 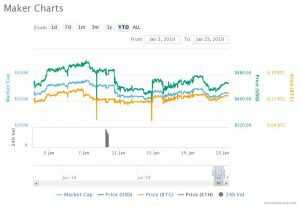 Maker, the 20th largest cryptocurrency with its current market cap traded at 380,934,056USD (10:30 UTC) on January 23 slashed in current value by 15.6% compared to January 06 as analyzed from the graph above. The strong bearish pressure and competitive forces have caused a drop in value relative to January 06 which best can be judged from the graph above. With this, the MKR/USD pair remained ‘uptrend’ from December 17, 2018, to January 09, 2019 thereby elaborating the ‘bullish sign’ so that all those that long awaited to invest in this altcoin may explore to create a long position. Now that MKR/USD pair increased in value by 40.8% compared to December 12, 2018, which can well be analyzed from the graph above, which signifies the bullish trend going forward. Since the current value traded below the 20-day EMA which states the ‘downtrend’ in value. Traders should remain on the sideline until the next “uptrend” takes place likewise how it experienced on mid-December onwards to January 09 which can be estimated from the graph above. Since the beginning of the year – 2019 seems to be fruitful for most of the altcoin as most of the cryptocurrencies have experienced to some or a more significant extent gained in value. Now let me walk you through the MKR/USD pair remained range bound from December 18 to January 04 as the cryptocurrency rallied from a low of $384 to a high of $540 which is a 40.63 percent return within 17 days. As we can quickly analyze from the graph above that the MCap traded at 380,934,056USD (10:30 UTC) with the Price (BTC) 0.12786464 and Price/USD 523.10 (10:30 UTC) 24h Volume 399,428USD (10:30 UTC). Since the aforesaid chart states that MCap traded all-time high on January 09 above both Price (BTC) and (USD), since then it dropped like a stone on January 08 and then gained in value, however, today the BTC price range traded high (10:36 UTC) above MCap and Price USD which signifies that how investors become bullish in buying this currency. But based on the 20-day EMA, one can estimate the proper judgment. While we can estimate from the first graph, if bulls succeed in rising and sustaining above the current resistance level $460 (10:44 UTC) and create “uptrend” in value (i.e., traded above the EMA) the investors will start buying this currency more and more thereby increasing its value. However, based on the current trend, the next support level could be $475. Let me elaborate more about Maker which is a smart contract platform on Ethereum that backs and stabilizes the value of Dai through a dynamic system of Collateralized Debt Positions (CDPs), independent feedback mechanisms, and appropriately incentivized external actors. With this, Maker enables anyone to leverage their Ethereum assets to generate Dai on the Maker Platform. Once it is created, Dai can be used in the same manner as any other cryptocurrency likewise it can be freely sent to others, used as payments for goods and services, or held as long term savings. Additionally, the generation of Dai also creates the components needed for a robust decentralized margin trading platform. Let us not forget that the Dai Stablecoin is a collateral-backed cryptocurrency whose value is stable relative to the US Dollar since we believe that stable digital assets like Dai Stablecoin are essential to realizing the full potential of blockchain technology! Please feel free to visit https://makerdao.com/en/ to know more about this cryptocurrency!